The image unquestionably stands on its own. Love the contrast and the framing you used to capture this spectacular view. The light emerging from the dark clouds is the focal point for me. Beautiful! Otto–this is gorgeous. No, I think I would call this photo ‘powerful.’ It is wonderful. Thank you for the lovely words, Lois. What a beautiful capture of the sky and light……and the silhouette of trees make it just perfect. Love the strong tree silhouettes against the soft mountain and cloud background. Gorgeous Otto! Where was this taken? 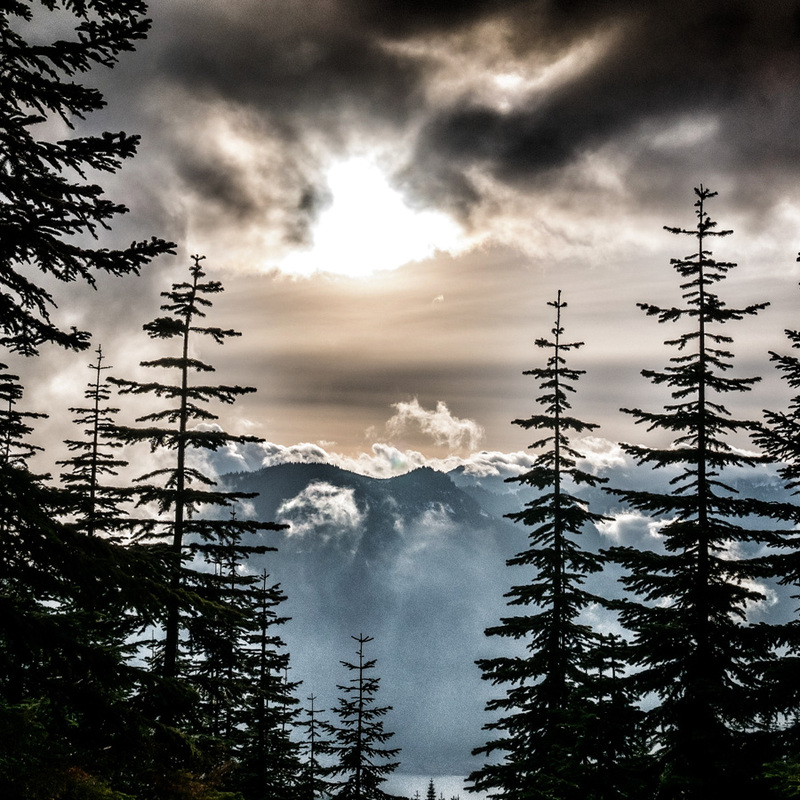 It’s taken in the Snoqualmie Mountains in Washington State, USA. Majestic!!! That one shot makes you believe in a lot of things. That is a lovely response. Thank you, Michelle. Tranquilizing and draws me into its beauty. It was a beautiful late afternoon. I love this image, Otto — it’s so wonderfully atmospheric! When do we not like your posts!! What a nice thing to say. Thank you so much, Paula. I love the play of the clouds, like they are telling a story on it’s own. I am happy you do. Thank you. Cornelia. I don’t mind when you repeat such an encouraging word. Thank you, Debra. Another commenter mentioned framing, and I agree, I like that about this shot, I also like the tones in it. A awesome scene! Love how the clouds in the sky broke out and fog covered the lower parts of the mountains far away. I’m seeing the fluke of a whale between the trees! Has my imagination run wild (again) or is it too many late nights? Love this Otto. What a creative color reversal, Otto. Accustomed to brown hills and blue skies, I was stopped by the scene; it seemed perfectly familiar, and yet utterly strange. There’s something more than usually dramatic about the image: it recalls the skies of El Greco, or perhaps a Wagnerian opera. I wouldn’t be surprised to see a Valkyrie come riding over that mountain crest. The Valkyrie was there, but I couldn’t get her to get in front of the special vista. So beautiful. Love the light in this photo Otto and the way it’s framed. Those mountains look shrouded in mystery, very mystical! It was a mystical moment, between rain, snow and sunshine. Thank you, Will. There is always a parcel of the beauty of this world revealed in your photos. This one is especially magical! Thank you, Dominique. Much appreciated. You are welcome Otto. Have a wonderful week ahead. Thank you, Robert, it was quite some light. It looks like the heavens parting and angels singing — but cold 🙂 Lovely shot. Great capture Otto, it gives me a Fall feeling. I like this one. It’s very atmospheric! Thank you for the feedback, Bertie. That’s a very dramatic effect, Otto. Very special light Otto, you caught the perfekt moment ! Hi, what’s your Instagram account?